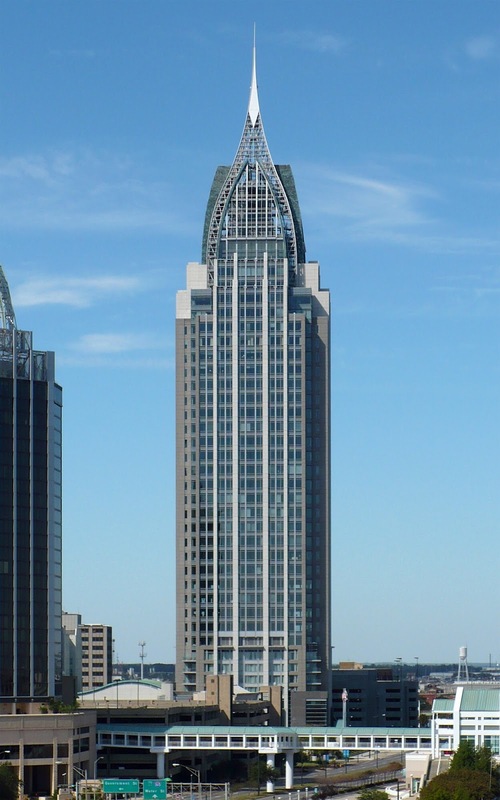 RSA Battlehouse Tower, owned by the Retirement Systems of Alabama, is located at 1 North Water Street in Mobile. It stands 35 stories high and measures 745 feet tall from base to tip. It surpassed the Wells Fargo Tower in Birmingham to become the tallest building in the state. Construction began in 2003 and the tower was completed in 2007. It is a postmodern skyscraper with a concrete, granite and curtain wall façade. The tower was named after the nearby Battle House Hotel, which is now part of the tower complex. RSA Battlehouse Tower dedicates the majority of its floors to commercial office space. It also has a three-story lobby, four floors of hotel rooms, and a service floor. The spire on top of the building was placed by a helicopter.